MCS Foundation Kick-Off Day | "MCSpirit!" 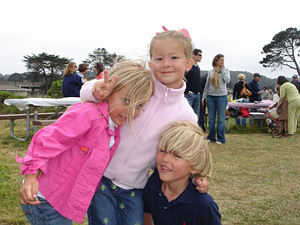 On June 14, 2008, Mary Claire Satterly's family, friends and colleagues at Goodby Silverstein & Partners, where Mary Claire worked in advertising, gathered for a daytime picnic at one of MC's favorite San Francisco spots, Crissy Field. Frisbees were tossed, children ran back and forth from the beach, and MC stories and laughs were exchanged among guests as they happily consumed North Carolina barbecue and lifting "Spririts." 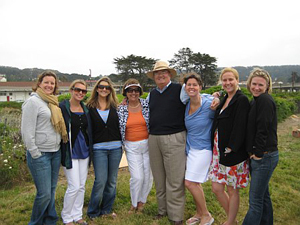 As the fog gave way to a sunny afternoon overlooking the Bay, Mary Claire's siblings, Karen, Laura and Stephen proudly "kicked off" the Mary Claire Satterly Foundation, of which so many of the attendees were instrumental in forming. The announcement of the Foundation's first of many goals, to establish the Mary Claire Satterly Pediatric Oncology Playroom in the new NC Cancer Hospital in Chapel Hill set to open in the fall of 2009, was met with excited cheers and overwhelming support!